DivX has been one of the most used formats when it comes to digital video. Since the end of the 90s, DivX has helped us getting video from their original digital or physical formats into more lightweight versions that we can handle with almost no loss in quality to watch on our computers or other devices such as portable media players or, in recent times, even game consoles. So yes, it can be very helpful to convert a movie for instance from AVI to DivX format, since you can save up some space and even have some more options for playback like menus or even multiple audio tracks for different languages. However it can be the other way around. As time has passed, new formats have appeared and videos can be easily compressed and have other options than DivX does not provide. For instance, the only software that is able to play DivX videos is the DivXPlayer itself. Game consoles, mobile devices and portable media players usually do not support DivX format either, so you will most likely have to find a third party software that plays it for you. Some other devices will support other formats, for example AVI but not DivX, so it is equally as important that you are able to convert from DivX to AVI in case that you need it. What tools do I need in order to convert AVI to DivX or DivX to AVI? Converting between AVI/DivX videos can be very simple, as long as you have the right tool. The list of video converters can be long, but you have to be careful since not every one of these will be able to handle DivX video. But if you are interested in using a unique application for your video converting without having to worry about anything, Aimersoft Video Converter Ultimate is the only tool that you will need. Aimersoft Video Converter Ultimate is a very complete software that allows you to do any kind of video conversion and even incorporates several useful options for editing. You will have the capability to change any setting on the destination format for your converted videos, or you can also switch between conversion profiles in case you are looking for a quick option: simply select the device or type of video that you need, and it will do all the work for you. The best part is that unlike many of the other options you will find, Aimersoft Video Converter Ultimate is a powerful software packed in a nice wrap, you will have everything you can possibly need in a good-looking interface that works for you and lets you have access to every option, just as you need it. It does not matter if you are using Windows or Mac, desktop or laptop, Aimersoft Video Converter Ultimate (for Mac) will work on every option, so you do not have to worry about your operating system and other requirements. But that is not all, unlike other applications, Aimersoft Video Converter Ultimate not only works in your operating system, but it also is optimized for it, so you will have a program that does not just look good, but that you can use without sacrificing any of your whole OS experience. 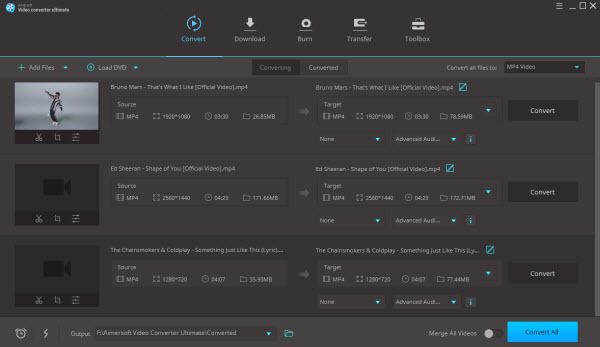 After installing Aimersoft Video Converter Ultimate on your computer and run it, you will find yourself in the Convert section of the program. From this point you need to click on "Add Files" in the center of the screen, or you can simply use drag and drop on the files you select for conversion. Tip: you can add DivX or AVI files as well as any other video formats, so it does not matter if you are trying to convert DivX to AVI or AVI to DivX, the process will be the same for all steps. Once the videos are in the Aimersoft Video Converter Ultimate application, you will see them on a list, remember you can rearrange their order or even discard some of them. Now you need to select the Output Format for the videos. Windows users will find Output Format: to the right side of their screen. From here you just need to select AVI or DivX, according to what you need. Make sure where your final files will be saved to by changing the Output Folder: address at the bottom. After you click on Convert at the bottom-right corner of the application, the converted files will be located in the folder you selected before. And that's it! In only three steps you can now enjoy your DivX or AVI files wherever you want to. These are just the basics, but remember that you can get a lot of options by clicking on the Settings button of the format you selected in the application, this way you will have complete control of how you convert your videos. Note that here video converter Mac version screenshots are used to show you how easy the while process is. The way to convert from DivX to AVI on Mac is the same. So you just need to make sure you've got the right version. Run the software and click "Files" > "Load Files" to load the DivX videos that you want to convert to AVI. Once the files have been added, you can preview them, take snapshots of your favorite video scenes, choose preferred subtitle and audio tracks, etc. Tips: Before converting the files, you can click Edit to customize your videos. Video editing functions like Trim, Crop, Rotate, Add Watermarks, Insert Subtitles, etc. are provided. Next, click Output Format on the bottom and go to Format > Video to select AVI profile as the output video format. Then you can click Output Folder to set a path to save the converted video files. At last, click the Convert button to start the conversion process. When the conversion completes, open the destination folder to save the converted AVI movies. And it's done! 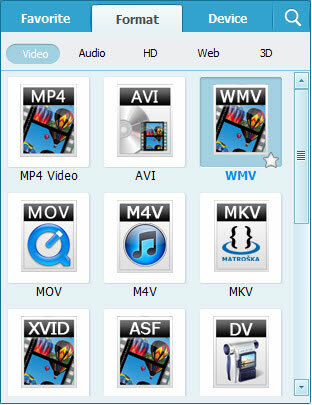 Why not download it now and view your DivX files on any AVI players? Simply load the files into the application, choose the quality and output format desired for video conversion. You can get a couple more features on this application but it remains simple and easy to use. You can get it for Windows following this link. Virtualdub This goes a little further since it is not exactly a video converter but a video processor which will allow you to perform video conversion in a large number of video files at a time. Ypu can download it for Windows at this link. Another video converter that includes some added features but remains simple to use, with a free version for Windows computers that you can download from this link. This is actually not a converter but a video editor with some very basic options. However it also has the video encoding capabilities that you will need while converting DivX/AVI videos. You can download it for Windows, Mac and Linux from this link. Free DivX Converter This simple tool will allow you to convert between DivX, AVI and most popular video formats very easily. You can get it for Windows by clicking on this link. When you think about video files you might immediately think AVI and this is fair since it has been within us for more than 20 years. So basically its popularity has taken it to the top of the list when it comes to videos. DivX is not exactly new to the scenario, it has also worked its way into the most known video formats. However they both have their pros and cons. While AVI promises to give the highest quality, it constantly deals with the file sizes, if you want an AVI file with an outstanding quality then you better be sure you have plenty of room to spare since it will take up a lot of it. DivX on the other hand, has managed to deliver much lighter files with a great quality but its biggest issue is that most of the times you will not be able to reproduce these files unless you have the DivX player. On times like these when almost everybody rely on mobile devices daily, it is very important that we use the most appropriate formats, making sure that whatever we need to carry on our smartphones or tablets will be supported and will not leave us a bad time because we not only cannot reproduce our files but we have to figure out which is the application that works better. Even though AVI files are still common and they are supported on many different devices they also have become a very limited option. While DivX files appear to be an easier solution, its inability to play on different devices make them the perfect candidate to be converted. Regardless of the video format you prefer, there is always a way to solve it. Tools like Aimersoft Video Converter Ultimate turn out to be the perfect companion when you are having trouble with those files because it will let you convert them to the format you find convenient and it will not compromise its quality. But more important, it will help you save time and finally, make your life much easier.